I would never forget my visit to Ashabhavan school in Nedumkandam, a remote village in Kerala, in southwestern India. The car stopped in front of an L-shaped building and Jose Jacob, the photographer, and I got down to ask someone directions to the principal’s room. We had hardly spoken when we saw a nun in habit and veil rushing out of a room. She jumped over some rose plants on the side of a corridor and rushed to our car, opened its rear door and pulled out a little boy from inside. Nobody had seen the boy getting into the car — not even the driver who was still at the wheel fiddling with his cellphone. The whole incident — the boy slipping inside the car and “the sister act” — happened in split seconds. We had telephoned her before coming, so she knew the purpose of our visit. “Come let us go to my room,” she said as she led to the corridor. This time she took the stairs. The 49-year-old sister was still holding Shiyas’ hand as she took her seat behind a glass-topped table with a few neatly arranged books in a sparsely furnished room. The boy then saw Jose Jacob’s camera and freed his hand and rushed to him. Sister got up and dragged him back. This act continued several times during our hour-long interview. Sister Elsa, the principal, said the school strives to teach the children self-reliance. The principal explained the boy was brought to boarding school only a day earlier and it would take some time to subdue his hyperactivity. “Until then, he needs special attention. He may even slip out of our compound,” she said. As we were completing the interview, Sister Sneha Moorkkenthothathil, one of the four Sacred Heart sisters working in the school, came and took charge of Shiyas. Like other staff, she came to the school with a degree in teaching differently abled children. During our visits to the school over a period of three days, we met half a dozen children who had to be attended by staff members individually. “They need constant attention,” said Sister Sneha, whose first name means love. Love for the weak and differently abled was evident everywhere in Ashahavan (Home of Hope) as the staff, including sisters, served meals for the children, arranged them for the school assembly and oversaw classes and games. Mood swings are common among the children. “Oh, I have received many hits and punches,” Sister Sneha said. “But they are so loving. They notice even a slight change on our face and get worried. They are so innocent, unlike the normal people,” she added. Over three days, we had also become close to those children. As we left the place, we promised to visit them again. As we drove back to Kochi, some five hours west, Jose Jacob and I agreed: Ashabhavan would not be remembered as just another reporting assignment. 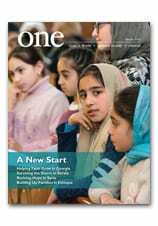 Read more about “Kerala’s House of Hope” in the Winter 2015 edition of ONE. And if you’d like to continue making schools like this thrive in India, visit this giving page. The U.N. Refugee Agency reported last June that at the end of 2014, the number of people forcibly displaced because of persecution, conflict and violence reached the highest number ever recorded; it had grown to “a staggering 59.5 million compared to 51.2 million a year earlier and 37.5 million a decade ago.” The U.N. estimated the number had surpassed 60 million by the end of 2015. The chief cause of the increase was the conflict in Syria, a conflict that is ongoing and continues to send people fleeing. In 2015, the U.N. reported, 244 million people, or 3.3 percent of the world’s population, lived outside their country of origin. The plight of migrants and refugees has been at the heart of Pope Francis’ concern as pope. Soon after his election in 2013, he went to the Italian island of Lampedusa to pray for migrants who had drowned attempting to reach Europe and to meet those who made it safely and those who have welcomed them. Meeting 11 January with ambassadors representing their nations at the Vatican, the pope made his concern for migrants and migration the key focus of his speech. While acknowledging the social and political challenges that come with welcoming migrants, Pope Francis insisted on the human and religious obligation to care for those forced to flee in search of safety or a dignified life. The pope’s concern for refugees is not just talk. In September, the Vatican’s St. Anne parish welcomed a family of four from Damascus, Syria, providing an apartment, food and other assistance because under Italian law, asylum seekers are not allowed to work for the first six months they are in the country. The parish of St. Peter’s Basilica is hosting Eritrean refugees. A woman, whose husband is missing, gave birth to her fifth child shortly after arriving in Rome. She, the newborn and two of her other children are living in a Vatican apartment; she hopes soon to embrace her other two children, who are now in a refugee camp in awaiting the completion of family reunification procedures. In the meantime, the woman is hosting another Eritrean woman and her child in the apartment.